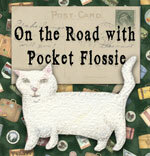 flossie's world: Why I Love Vacation. Everyone else is finally on Flossie Time. We might just sit and read a book. And of course, every evening we have to sit quietly together and wait for the sun to set. Vacation provides more than usual Lap Opportunities.